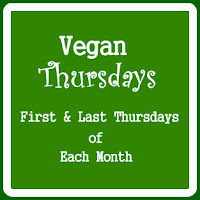 Hi friends, today's post for Vegan Thursday, as you all know that the event initiated by the great blogger aka akka +Priya Suresh... Every 1st and 4th Thursday you can post your vegan recipes with the VT logo. 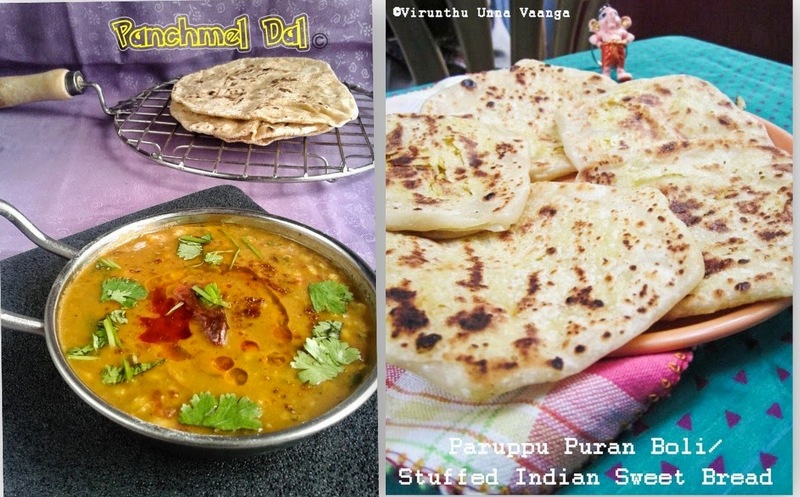 In the list of diwali recipes, this is my first savory for diwali... Yes!!! 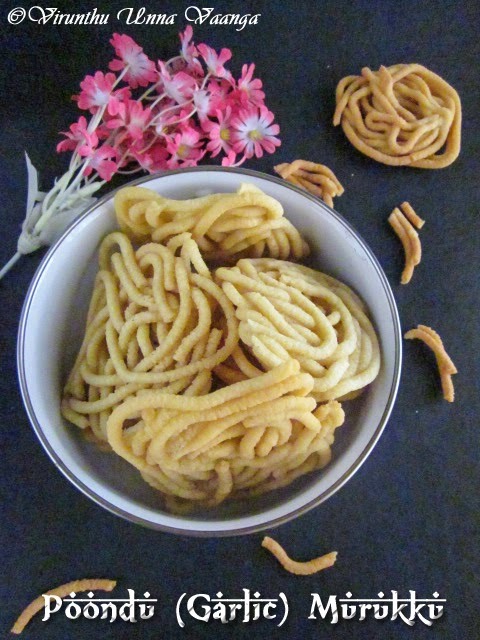 Mostly, the main recipes of diwali are Murukku and Adhirasam only, other recipes all are included by us... 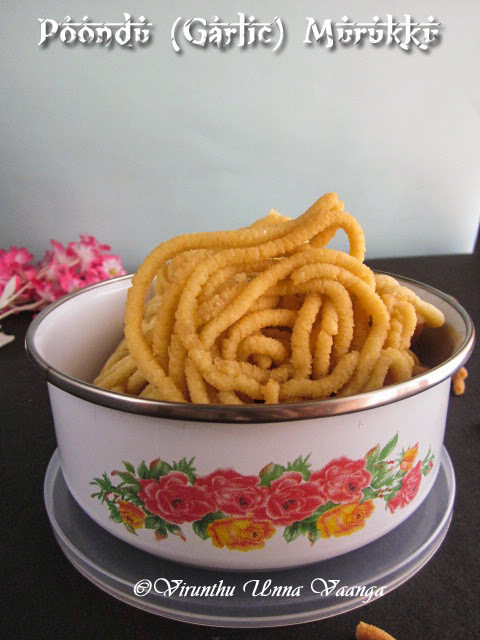 I love mullu murukku much than the normal variety, I wanted to try the mullu murukku, but that murukku achu was very tight, so couldn't use it. 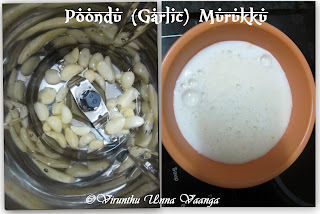 I tried poondu (garlic) murukku. I love garlic flavor much, and after seen +Sangee akka’s garlic murukku, I was so tempted to try out... 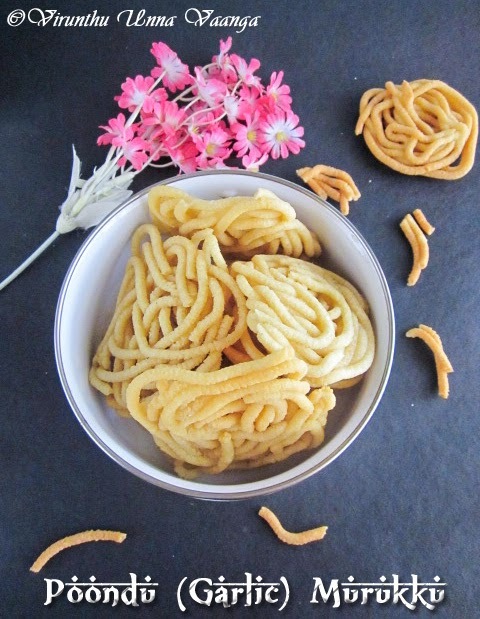 So I told to mom to make poondu murukku and we prepared the murukku from store-bought rice flour. 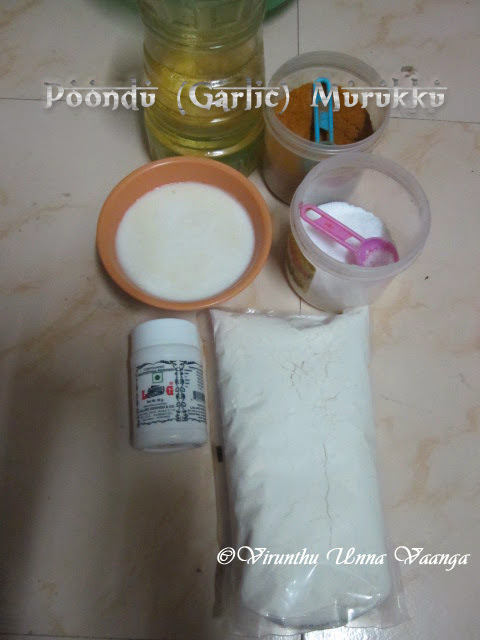 Take a wide mixing bowl, add rice flour, fried gram dal, red chilli powder, hing, salt and add garlic paste and mix it well till combines. 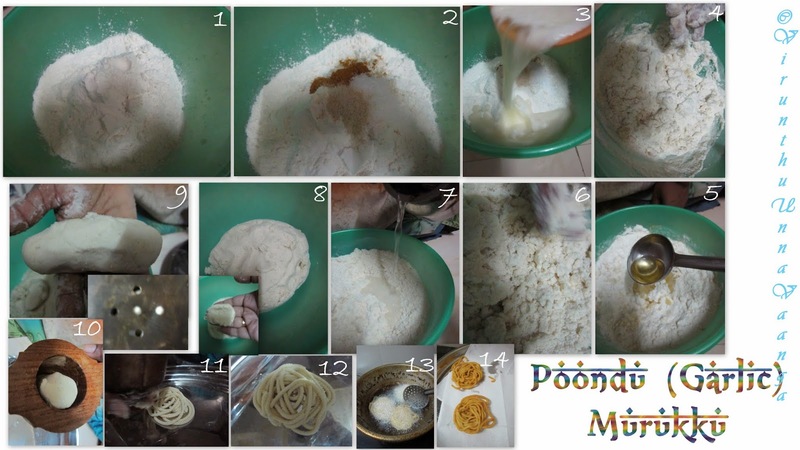 Add hot oil to the flour and mix it well. Now add little water and knead to smooth dough and keep it aside for 10 minutes. 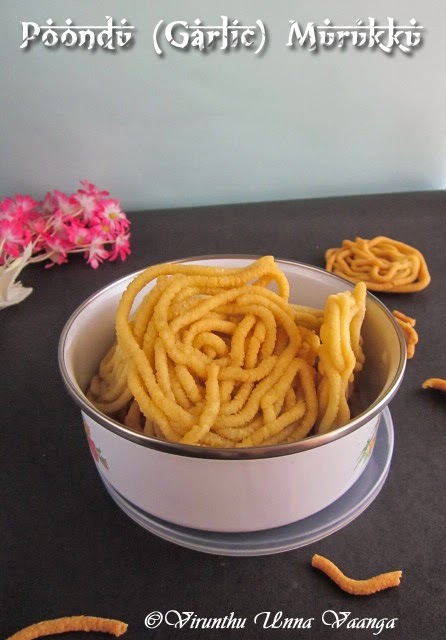 Take a Muruku achu and make equal size balls of the dough and keep one small ball into the murukku achu and press it in circular motion to make murukku in back of the ladle or greased plastic sheet. 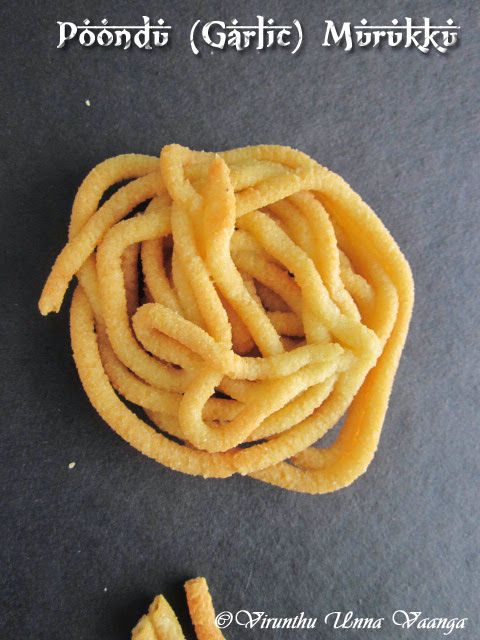 Place gently on the hot oil and deep fry it on both sides. 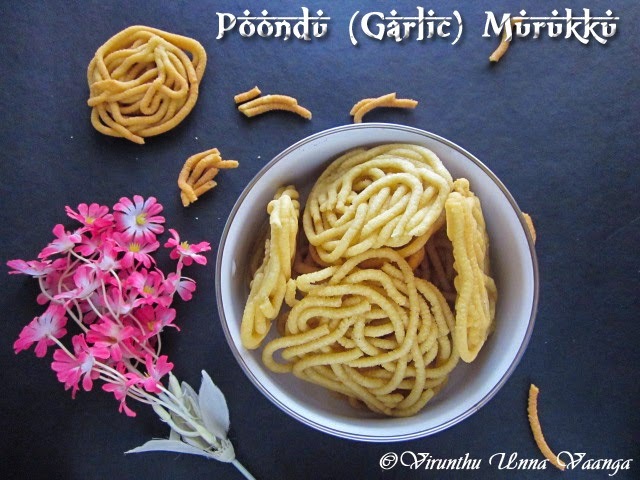 You can add ajwain, cumin or sesame seeds. 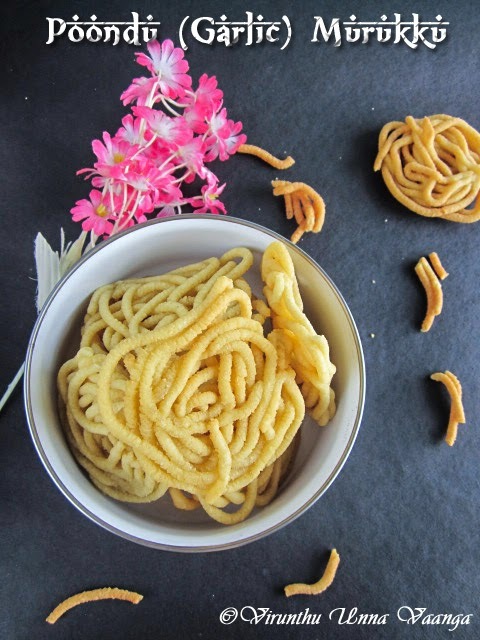 You can use Bengal gram flour instead of fried gram flour. For vegan, here I add hot oil, you can add melted butter or dalda to it. 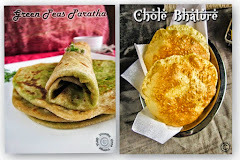 This is perfect for Diwali! 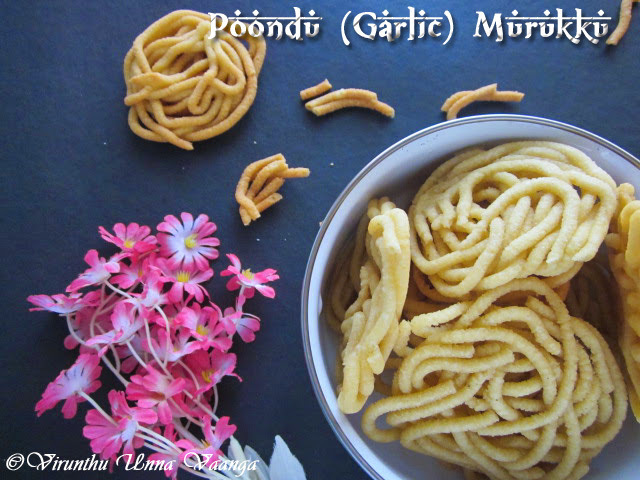 Crunchy munchy murukku,am in love with this garlic flavour murukku.